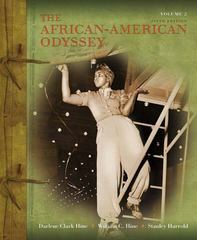 The African-American Odyssey 5 Edition More than any other text, The African-American Odyssey illuminates the central place of African Americans in U.S. history – not only telling the story of what it has meant to be black in America, but also how African-American history is inseparably weaved into the greater context of American history and vice versa. Told through a clear, direct, and flowing narrative by leading scholars in the field, The African-American Odyssey draws on recent research to present black history within broad social, cultural, and political frameworks. From Africa to the Twenty-First Century, this book follows their long, turbulent journey, including the rich culture that African Americans have nurtured throughout their history and the many-faceted quest for freedom in which African Americans have sought to counter oppression and racism. This text also recognizes the diversity within the African-American sphere – providing coverage of all class and of women and balancing the lives of ordinary men and women with the accounts and actions of black leaders and individuals.